NEW YORK — Soon after Colorado legalized recreational cannabis, Todd Mitchem’s son proposed using the plant for a horticulture project at his Montessori school in Denver. School officials said no way, despite support from dad, a regular weed user and chief executive of a dating app and social network for fellow enthusiasts. “They didn’t want to touch it. They weren’t ready to touch it,” said Mitchem, who is divorced and shares custody of his kids, ages 11, 9 and 7. That was early 2013. Now, pot is everywhere in the state, along with three others and the District of Columbia that pushed beyond sanctioned medicinal use to legal consumption just because. Mitchem, 44, has been speaking openly to his kids about cannabis since he first entered the industry a couple of years ago. He co-founded the app High There! in addition to running it. So how has legal weed changed the parenting pot conversation for him and others raising kids while working in the fast-growing business segment? It’s also not OK for them to try pot in any other form. Not only is it illegal since they’re under 21, but it’s bad for their developing brains, dad said. Has Mitchem’s work and pot use changed the way he is perceived among other parents? Cassandra Farrington, 43, is co-founder and chief executive of Marijuana Business Daily, a Denver-based industry publishing and conference planning company. She’s also a Girl Scout troop leader and mom to a 10-year-old girl and 8-year-old boy. Farrington and her husband do not use cannabis, but she acknowledged her timeline for talking to her kids about it was likely accelerated by her work. In Colorado, where pot shops are plentiful, not having the pot conversation isn’t an option. “It comes up on the evening news. You drive down the street and you’re passing a dispensary and there’s a funny smell,” she said. Farrington’s company held its first national cannabis conference in Denver soon after the state constitution was amended in 2012 to allow for adult recreational consumption. It was a high-profile affair. In addition to Colorado and the District of Columbia, Washington state, Oregon and Alaska have legalized marijuana for recreational use. A number of states have also decriminalized the possession of small amounts of pot and passed medical marijuana laws. 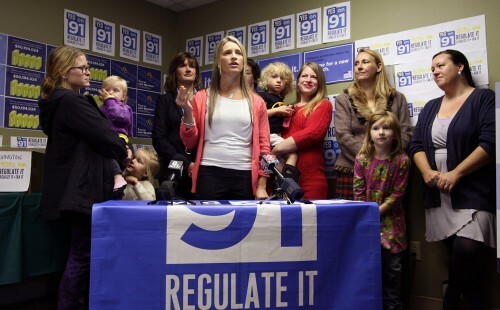 Brittany Driver, 30, owns a cannabis public relations agency in Denver, writes about parenting issues for The Cannabist and is co-chair of a chapter of Women Grow, which supports women in the business. She is a user of medical marijuana to stimulate her appetite, and she has a 3-year-old son. His pot conversation has been a running dialogue, he said. Pretending, in a legal or illegal state, that teens aren’t going to encounter marijuana is not realistic, Barcott said. “I told my daughter, ‘Look, it’s hard enough to maintain a good GPA as it is. Imagine trying to do that when you’re drunk three nights a week or if you’re using pot,'” he said. Barcott remembers the time he brought home a small cannabis plant to photograph and study for his book. It did not go unnoticed by his kids.